Could Bionic Plants Be The New Solar Cell? Photosynthesis – the means by which plants are able to convert sunlight and carbon dioxide to useable chemical energy -- is one of the more remarkable natural feats. Scientists have long sought to exploit the process as a method of more efficiently harvesting solar energy, but have so far been thwarted. One of the major drawbacks of using chloroplasts, the organelles responsible for photosynthesis, as a solar power material is that they only absorb about half of the incident sunlight. Now a research team led by Michael Strano of MIT and funded by the US Department of Energy has found a way to nanobioengineer the organelles using carbon nanotubes to dramatically increase the range of light absorption and enhance energy generation by nearly 50%. 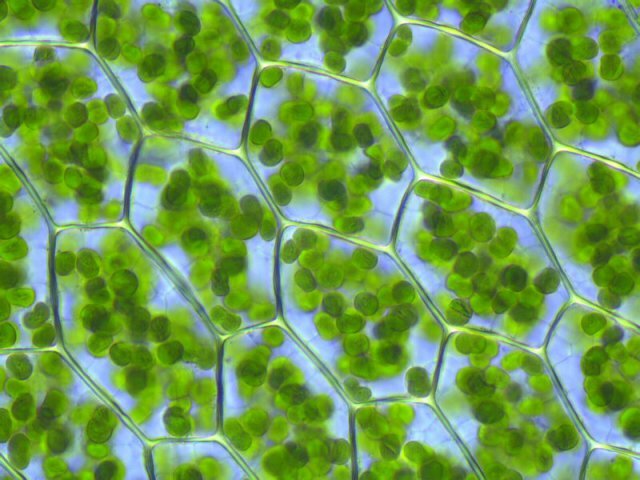 Chloroplasts inside cells: these green organelles responsible for photosynthesis can be artificially enhanced by the incorporation of carbon nanotubes. Image by Kristian Peters. Their method relies on a process called lipid exchange envelope penetration (LEEP) which essentially refers to convincing the chloroplasts to uptake non-biological materials like nanotubes or nanoparticles. To do this, the team took single-wall carbon nanotubes (SWCNTs) and wrapped th Carbon nanotube: the structure of these hollow carbon cylinders gives them remarkable optical and electronic properties.em in DNA and the biomolecule chitosan. The resultant complexes then spontaneously penetrated the walls of the chloroplasts. Carbon nanotubes are hollow cylinders made up of carbon atoms arranged in a honeycomb-structured lattice. They are renowned for both their optical and electronic properties, and their discovery in the early 1990s set off a new era in organic-materials-based electronic devices. Indeed, they have been previously explored as agents in artificial photosynthesis. Once inside the organelles, the light absorption properties of the semiconducting SWCNTs allowed for a substantial increase in absorbed sunlight and thus chemical fuel production. Using the same technology, the researchers addressed another major challenge when attempting to use photosynthesis as an energy source: the tendency for organelles to rapidly degrade upon exposure to oxygen. While plants have a built-in mechanism to mitigate this degradation, organelles isolated for use in solar power generation have no such support system. To mimic an equivalent process, the scientists also took advantage of LEEP to embed cerium oxide nanoparticles in the chloroplasts. These nanoparticles have been previously demonstrated to scavenge the disruptive reactive oxygen species. The results were quite spectacular. The bio-engineered plants showed a 30% increase in chemical energy generation while isolated organelles improved by an even-more-impressive 49%. The incorporation of the cerium oxide nanoparticles also yielded a notable reduction in oxygen-related damage to the chloroplasts giving the bio-solar cells a longer lifetime. To take the concept of bioengineering one step further, the researchers even took advantage of their system to provide the plants with a whole new functionality – that of biosensing. The presence of the SWCNTs allowed the leaves of the plant to act as nitric oxide sensors. Nitric oxide is, among other things, an environmental pollutant resulting from combustion reactions in automobiles or at fossil fuel power plants. SWCNTs have already been shown to act as nitric oxide sensors and their new home in the photosynthetic machinery of a plant left this property conveniently unchanged. Infrared images of the engineered plants quickly revealed the presence or absence of the pollutant. In a world where the need for renewable energy supplies are increasingly in demand, relatively simple and environmentally-friendly alternatives like plant-based solar energy generation may soon become the new norm. Research like this is on the cutting edge, but it is likely only the very beginning. Via: Nature Materials and the US Dept. of Energy. An Electronic Ruler That's Smarter, Easier, And Even FUN To Use!